What is Ascaris lumbricoides? What do Ascaris worms look like? What are the signs and symptoms of an ascariasis infection? What are the risk factors for developing ascariasis? How do health care professionals diagnose ascariasis? What is the treatment for ascariasis? What type of specialists treat ascariasis? Are there home remedies for ascariasis? What are the complications of ascariasis? What is the prognosis of ascariasis? Is it possible to prevent ascariasis? Ascariasis is a disease caused by a parasite named Ascaris lumbricoides. Ascaris lumbricoides is a large nematode (roundworm) that infects the human gastrointestinal tract; the adults are visible to the naked eye and can reach over 12 inches in length. Parasites cause ascariasis as they proceed through their life cycle in humans. Risk factors for ascariasis infection include living in and/or visiting tropical and subtropical areas along with poor hygiene and eating or drinking contaminated foods. passage of parasites and their eggs in stools. Health care providers diagnose ascariasis by detecting characteristic Ascaris lumbricoides eggs in feces with a microscope; other tests may also be done (X-rays, ultrasound, for example). Treatment is oral medication for about one to three days in patients who do not have additional complications. Primary care doctors may treat ascariasis. Patients who have complications may need specialists such as infectious-disease specialists, lung specialists, and/or surgery specialists. There are many home remedies for ascariasis, but a patient should discuss their use with a doctor before attempting these remedies. Most of the complications of ascariasis occur in the gastrointestinal tract with obstruction of the G.I. tract as a major complication; other organs may also be involved. The prognosis for ascariasis is very good when health care providers diagnose and treated ascariasis appropriately. The prognosis worsens if complications develop; ascariasis may also increase fertility in women. It's possible to prevent ascariasis by avoiding contaminated food and water sources and by good hygiene and eating only cooked hot food while traveling. Roundworms, also known as nematodes, are a common term for parasites that comprise the phylum Nematoda that contain mainly free-living species and are located everywhere on earth. Roundworms are not ringworm, which is a fungal infection. Researchers estimate there may be as many as 500,000 species, but only about 60 species infect man and animals as parasites. The most commonly identified parasites that use us and some animals as food for survival, multiplication, and spread (transmission to others) are termed ascariasis, trichuriasis, hookworm, enterobiasis, strongyloidiasis, filariasis, and trichinosis. Each nematode has a life cycle that can be complex. Many have only part of their cycle completed in humans and animals. Ascariasis is one of the tropical diseases caused by the parasite Ascaris lumbricoides, a large nematode (roundworm) that infects humans in the gastrointestinal tract and requires human infection to complete its complex life cycle. Another species, Ascaris suum, which infects pigs may occasionally infect humans. 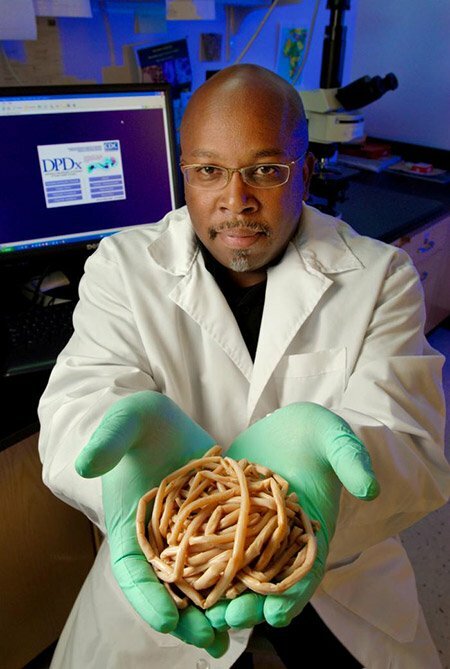 Ascaris lumbricoides, also known as roundworm, Ascaris worms, or giant roundworm, is a nematode parasite that can infect humans by residing in the gastrointestinal tract or in other areas of the body such as the lungs. The worms have a worldwide distribution but are most common in tropical and subtropical areas where humans have poor sanitation and where human feces is used as soil fertilizer. Many individuals infected show no symptoms, but abdominal discomfort and/or cough are two major symptoms of infection. The roundworms are the largest nematode parasites that live in the human intestine. Figures 1 and 2 show how large and how numerous these intestinal parasites can be. Figure 3 shows the life cycle of the worms in the human -- from ingestion to penetration of the intestinal lining to migration and maturation in the lungs, migration to the throat and then to small intestine where they mature and produce eggs that are passed with stool, where they await ingestion by other humans. Worm infections (helminthic or helminth infections) are a group of diseases caused by parasites transmitted through contaminated soil. These parasites include whipworms, hookworms, and roundworms (Ascaris and Strongyloides that cause strongyloidiasis). The diseases they cause are termed helminthiasis. This article is limited to Ascaris lumbricoides infections. The cause of ascariasis is the invasion, spread, and eventual maturation of Ascaris lumbricoides in the human host. The symptoms described below are due to the parasite's ability to penetrate the intestinal tract and proceed from there to the lungs where they eventually mature further and penetrate the air sacs of the lungs, migrate to the throat, and are subsequently swallowed to allow maturation in the intestinal tract. Although the nematodes exist worldwide, the most common areas they inhabit are areas where the climate is warm and moist such as tropical and subtropical regions of the world. The highest risk factors for contracting this infection are poor sanitation and poor hygiene. 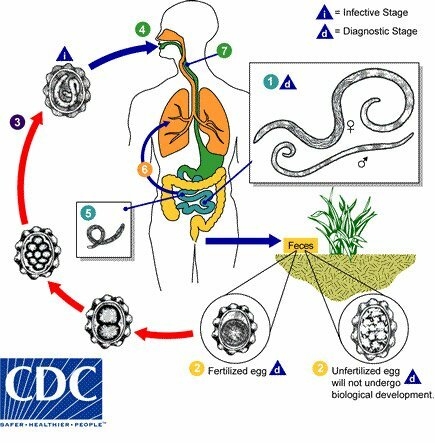 Ascariasis is transmitted indirectly in most cases by an uninfected individual ingesting contaminated food or water that contain the Ascaris eggs deposited by infected humans in their feces into the environment. Children are commonly infected in these areas; school-age children are more frequently infected than adults are. 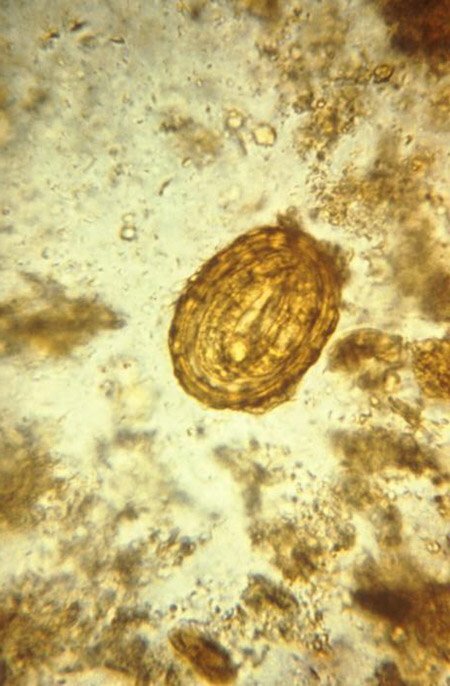 Health care providers easily diagnose infection by examining the stool sample from the patient using a microscope to identify Ascaris lumbricoides eggs. In some instances, stool particles are concentrated to increase the likelihood of finding the nematode eggs. Other tests that suggest infection include blood tests that show eosinophilia (the increased presence of a certain type of white blood cell); abdominal X-rays and/or ultrasound studies may detect a large mass of worms in the intestines. Fortunately, there are effective anthelmintic treatments available for ascariasis. Medications such as single-dose albendazole (Albenza) or mebendazole (Vermox) are drugs of choice for ascariasis. Health care providers administer the drugs for only about one to three days. Other drugs such as ivermectin (Stromectol), levamisole (Ergamisol), pyrantel pamoate (Pin Rid, Pin X), nitazoxanide, and piperazine citrate have also been used effectively. Pyrantel pamoate treats pregnant women; other drugs like mebendazole and albendazole may cause teratogenic effects in the fetus. Once diagnosed, primary care physicians can treat most patients for ascariasis. However, if complications like bowel blockage or intestinal perforation occur, other doctors such as a surgeon and/or infectious disease specialist may need to be consulted. Other severe complications can involve the lungs and may require a lung specialist (pulmonologist) to be consulted. There are a number of home remedies for ascariasis. Garlic, wormwood, pumpkin seeds, and many other herbs have been used to treat ascariasis. 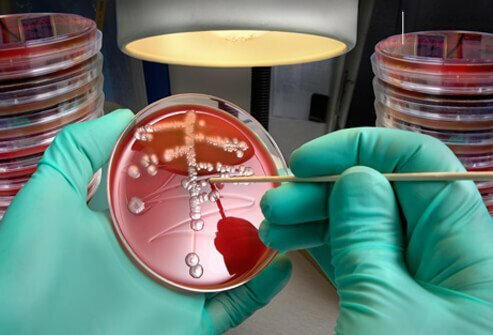 However, infected individuals should check with their doctor before utilizing any of these home remedies as their effectiveness might not be as good or as rapid as the prescription medications described in the treatment section. Organs other than the intestinal tract and lungs may be occasionally involved; some patients may have allergic reactions that may become severe. About 11,000 deaths occur each year worldwide due to intestinal obstructions caused by ascariasis, with the majority of patients being children. The prognosis of ascariasis for appropriately diagnosed and treated ascariasis is very good. However, the prognosis begins to decline if the patient develops a high number of worms in the body (worm burden). This worm burden can lead to more serious complications such as intestinal obstruction and worsens the prognosis of this disease. 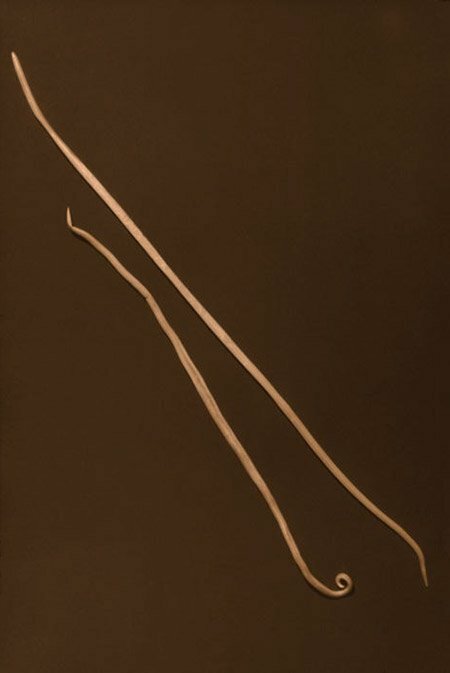 A female worm may reach a length of 14 inches (35cm). An interesting additional effect of ascariasis may be increased fertility in women who have the infection. Researchers in Bolivia suggest that the worm alters the immune system for its own protection that results also in allowing females to become pregnant easier. The mechanism of this enhanced fertility is unknown, but researchers suggest it could lead to development of fertility-enhancing drugs. Yes, it is possible to prevent ascariasis; before handling or eating any food, wash hands with soap and water and avoid drinking any local water sources when traveling. Use only boiled water or bottled water and avoid raw vegetables and fruits unless you can clean them yourself. While traveling, eat only foods that are cooked well and served hot. In addition, reinfection is possible for people who live in areas where ascariasis infections are common. Consequently, health care providers give some individuals, especially children, prophylactic doses of medication (such as ivermectin) every two or three years in some countries. The World Health Organization (WHO) estimates that up to 10% of the developing world's population has intestinal worm infections, with total worldwide deaths due to Ascaris infections at 60,000 per year, mainly occurring in children. Haburchak, David R. "Ascariasis." Medscape.com. July 30, 2018. <https://emedicine.medscape.com/article/212510-overview>. United States. Centers for Disease Control and Prevention. "Parasites-Ascariasis." Feb. 15, 2018. <https://www.cdc.gov/parasites/ascariasis/index.html>. Please share your experience with ascariasis. What were your ascariasis symptoms and signs? What treatment did you receive for ascariasis? Albendazole (Albenza) is a prescription drug used to treat a variety of parasitic worms from the body. Side effects, drug interactions, dosage, and pregnancy safety should be reviewed prior to taking this medication. Intussusception is the telescoping (prolapse) of a portion of the intestine within another immediately adjacent portion of intestine. Intussusception affects children between the ages of 3 months and 5 years of age. The causes of intussusception is not clearly understood. Symptoms of intussusception include bilious vomiting, "currant jelly stool," and colicky abdominal pain. Intussusception is an emergency requires immediate attention. Ivermectin (Stromectol) is a medication prescribed to treat infections caused by Strongyloides stercoralis and for infections caused by the adult form of Onchocerca volvulus. Side effects, drug interactions, dosage, storage, and pregnancy safety information should be reviewed prior to using this medication. Mebendazole (Vermox, discontinued) is a medication prescribed to treat pork worms, tapeworms, roundworms, hookworms, threadworms, pinworms, and whipworms. Side effects, drug interactions, dosage, and pregnancy safety information should be reviewed prior to taking this medication.